On Saturday, I attended the grand opening of The Hangar by Group Fly in Oklahoma City. The boutique opened at 10am to an eager, waiting crowd. Group Fly founder Vernon Deas came out to thank everyone for their support and let the first customers cross the red carpet into the building. The first 30 customers were greeted with a free shirt. The atmosphere of the store was full of buzz and excitement. 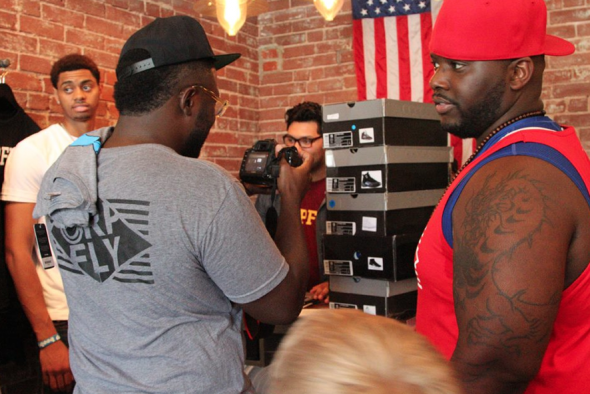 Everyone came out wearing their best streetwear and sneakers. Several supporters reached back far into their closet for the oldest Group Fly t-shirt they owned to prove their allegiance and show how long they’ve been down with Group Fly. The store stayed full all day. Several shoppers even came in after closing to make quick purchases. 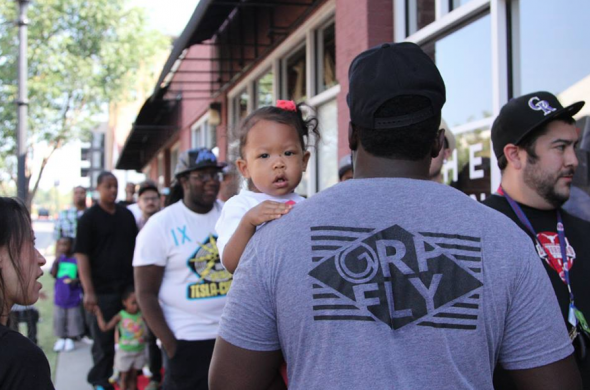 Group Fly founder Vernon Deas stayed busy greeting customers, taking hundreds of photos, and chatting with friends who came out to support. Several of The Hangar’s first customers were very well known faces around the Oklahoma City area. Local musicians such as Jabee and Josh Sallee made appearances as well as Oklahoma City Thunder player Jeremy Lamb and newly signed Los Angeles Laker Xavier Henry. The products did not fail to disappoint. 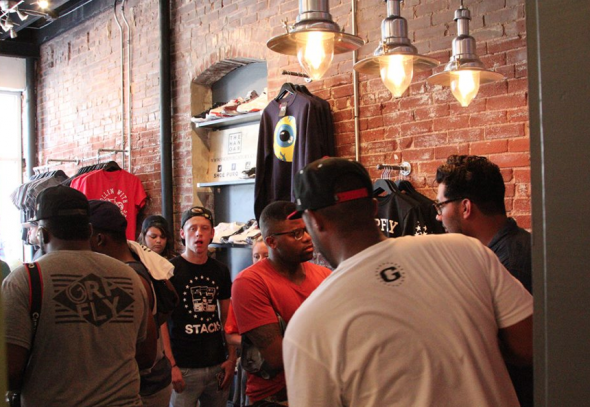 The sneaker consignment wall stayed busy while the Group Fly t-shirts flew off of the shelves. 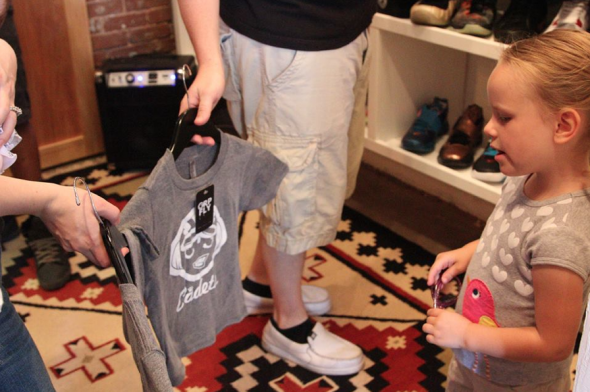 The brand new children designs were a hit with kids and parents. Group Fly also launched its newest run of designs titled Stealth. The crowd in Midtown was a great one to be a part of that day. Even in the scorching heat, supporters came out to see the shop and buy some cool clothes. Overall, the grand opening of The Hangar was a success. The Hangar by Group Fly at 1116 N. Walker will be open Tuesday through Friday from 11am until 7pm, 11am until 5pm on Saturday, open by appointment only on Monday and closed on Sunday. The Hangar is still accepting applicants for sneaker consignments and new brands to be featured in the store. If you are interested, contact Dakota@grpfly.com. See the rest of the photos here on Flickr. Tagged Friday, Group Fly, heat, Jabee, Jeremy Lamb, Josh Sallee, Los Angeles Laker Xavier Henry, Oklahoma City, Oklahoma City Thunder, Vernon Deas. Bookmark the permalink.